Sheila Martindale joined the Friends of The Malahat at the group’s inception in January, 2010. Malahat Circulation and Marketing manager, Susan Sanford Blades asked her a few questions about her literary Victoria. In December, we entered all Friends of The Malahat into a draw for two free tickets to the Galiano Literary Festival this February, and your name was drawn! Congratulations! What have you signed up for at the festival? What are you most excited to do there? I have signed up for the keynote presentation by Kevin Chong (followed by a panel discussion); readings by Pauline Holdstock, Michele Levy, Bill Gaston, Billie Livingston, Frances Greenslade, and Mark Leiren-Young; a workshop by poet Kim Goldberg titled “Kung Fu for Writers”; and a presentation on translation by Robert Bringhurst. Plus I will be at the Opening Reception and the Authors’ Dinner, with bells on! It will be a pretty packed few days. It is very exciting to be offered this opportunity and I am looking forward to it. You’ve been a loyal Friend of The Malahat since January 2010 and have attended many of our launches and events. What have been some of your favourites? I really liked the dinner and launch at the Fernwood Inn – that was special. An opportunity to chat with other Friends and Malahat personnel before listening to the readings. I prefer the events held off-campus, as the various downtown locations are more accessible for me. I believe you currently hold the position of secretary for the Victoria Writers’ Society, and, if I’m not mistaken, poetry editor for their publication, Island Writer magazine. How has being an active member of that group helped your literary life in Victoria? I was the poetry editor for a few issues, and I am currently the editor-in-chief. Again, I enjoy the contact with other writers when I am in that role. As secretary, I get to keep the lists up to date and send out information, which is more of an administrative thing, but it keeps those skills up to date. However, I would be happy to relinquish that job if anyone was willing to undertake it. Can you tell us a bit about your literary history prior to moving to Victoria? How does Victoria’s literary scene compare for you? The Victoria literary scene is unquestionably the best I have ever experienced. I started publishing and getting involved when I lived in Montreal in the sixties and seventies, and the scene there was good, but of course half of it was in the French language. I co-founded the Montreal Poets’ Information Exchange, which did a lot to bring the English writers together. Then I moved to south western Ontario, London to be exact, where there was a lot going on, but there was a split between “the town and the gown” – we were not always welcome at the University of Western Ontario unless we were teaching there. However, this was James Reaney country, and a lot had rubbed off. I got involved with running readings and events, and met some great people. I had a radio program called Cabbages & Kings, and interviewed hundreds of writers, both local and those passing through. During this time I was poetry editor of Canadian Author (from 1982 until 1997), a national magazine, and I got to know a lot of poets by correspondence. I was also associated with a lit mag out of the States, so had the American perspective as well. But poetry was not my exclusive domain. For 18 years I wrote a theatre column for a local arts paper, and was also publishing articles and op-ed pieces in many newspapers and magazines across the country. Of course, to some extent we were influenced by what went on in Toronto, and I did attend quite a few events there, and even published an article about one of them in The Globe and Mail. What have been some of your favourite stories or poems published in The Malahat Review since you began subscribing? That’s hard to say. In every issue there are some pieces that particularly strike me. I enjoy reading stuff by writers I am familiar with, and also by people whose names are new to me. I always pass my issues of the periodical on to other people, so don’t have a stack to refer to. You seem to be a fairly regular fixture at the Planet Earth Poetry readings series. What do you enjoy about the series? I think it is the atmosphere, which is always enthusiastic but at the same time respectful. It is a well-run series, which keeps to time limits usually, so I always leave with the plan of coming back for more the next week. The featured readers are varied, and many of them come from other places, so it’s always good to put faces to names you have read. I also get to meet poets whom I have known in other contexts, so there is catching-up to be done. And there is always someone or something interesting at the open mic! 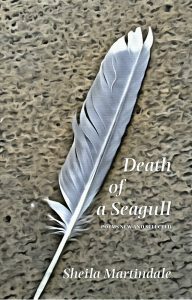 A few days ago I received a Christmas gift from Sheila Martindale:Death of a Seagull: Poems New and Selected. This collection is a summation of a life lived fully and with utmost awareness and consciousness. The poems are straightforward, and unlike much poetry from the academy, there is no pretense, artifice or attempt to impress, just heartfelt truths and realizations in an almost simplistic style. Sheila’s mastery of the haiku form is apparent, as the poems are tight, clear and transparent. All the poems are longer ones, a page or two is the average, but they are definitely not like self conscious renga. Sheila is a patron of all the arts – she volunteers for and attends ballet, symphony, theatre, and art galleries, as well as literary events. 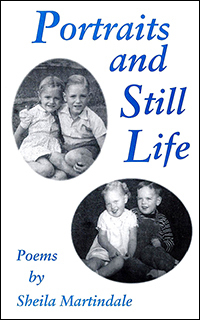 Her poems reflect this loving knowledge of other art forms accumulated over a lifetime, and she has completely integrated these various artistic awarenesses and disciplines into her own art.Sheila is also a lifelong member of the Anglican church, and her poetry reflects the humble and best aspects of Christian spirituality. She is also an immigrant to Canada, another of the many things we share. As a not obvious immigrant (from England), there is still much acculturation new Canadians experience, and this fresh vision provides a poet with insights into our culture which may escape the native born and raised. 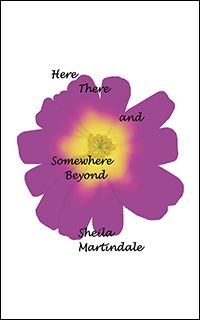 Sheila lived for extended periods in Montreal, rural southwestern Ontario, and she now resides in Victoria, British Columbia. after almost a dozen years?